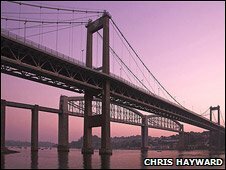 Drivers crossing the Tamar Bridge between Devon and Cornwall will pay more from Friday. The government has approved a rise from £1 to £1.50 for cars using the Tamar Bridge and the Torpoint Ferry. Regular users who have a Tamar Tag will pay 75p instead of 50p, it was agreed following a public inquiry. The rises are the first since 1994 and will also affect goods vehicles and coaches, with crossing prices based on vehicles' weight and number of axles. Bridge bosses said the rise was needed because routine costs of maintaining the crossings had increased. The crossings are jointly run by Cornwall Council and Plymouth City Council through the Tamar Bridge and Torpoint Ferry Joint Committee. The committee said the rise was "essential" because if charges were not increased, the gap between income and spending was expected to be £2.5m a year by 2011-12. It recognised that an increase in costs was "particularly unwelcome" but a rise had been deferred "for as long as possible". John McGoldrick, of the National Alliance Against Tolls, said: "The drivers who use the bridge are being treated as no more than cash cows. "The tolling of this part of the highways system is an anachronism which is particularly unfair on those drivers who use the bridge on a regular basis. "Instead of increasing the tolls, the government should help the local economy by completely removing them."